With its rolling eyes and changeable colors, a chameleon is like no other animal on Earth. There are more than 200 different kinds of chameleons (kuh-MEE-lee-unz), and nearly all of them live in Africa. 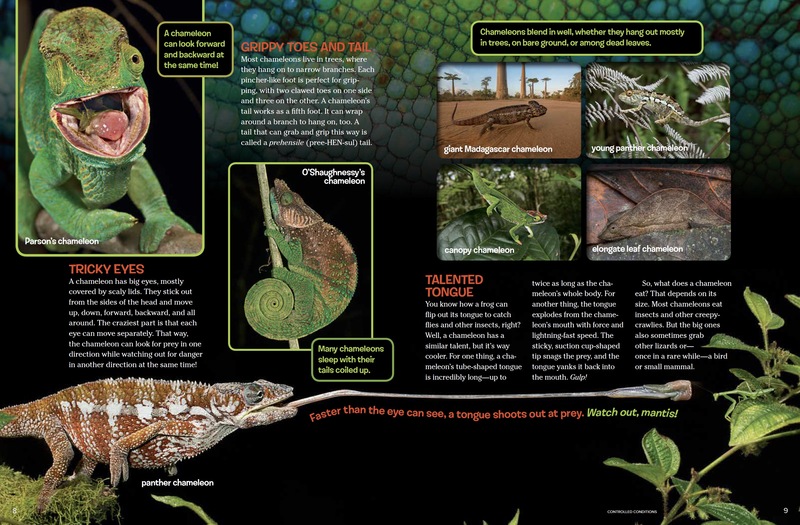 These reptiles come in lots of shapes, colors, and patterns. They vary from about an inch in length to the size of a house cat. And many may have horny “helmets,” knobby snouts, or spiny crests. But there are a number of things that make all chameleons the same. Read on! Most chameleons live in trees, where they hang on to narrow branches. Each pincher-like foot is perfect for gripping, with two clawed toes on one side and three on the other. A chameleon’s tail works as a fifth foot. It can wrap around a branch to hang on, too. A tail that can grab and grip this way is called a prehensile (pree-HEN-sul) tail. A chameleon has big eyes, mostly covered by scaly lids. They stick out from the sides of the head and move up, down, forward, backward, and all around. The craziest part is that each eye can move separately. That way, the chameleon can look for prey in one direction while watching out for danger in another direction at the same time! You know how a frog can flip out its tongue to catch flies and other insects, right? Well, a chameleon has a similar talent, but it’s way cooler. For one thing, a chameleon’s tube-shaped tongue is incredibly long—up to twice as long as the chameleon’s whole body. For another thing, the tongue explodes from the chameleon’s mouth with force and lightning-fast speed. The sticky, suction cup-shaped tip snags the prey, and the tongue yanks it back into the mouth. Gulp! So, what does a chameleon eat? That depends on its size. Most chameleons eat insects and other creepy crawlies. But the big ones also sometimes grab other lizards or—once in a rare while—a bird or small mammal. What everyone knows about chameleons is that they change colors. But most people wrongly think that they do it to blend in with their surroundings. Actually, their “normal” colors already blend in pretty well. What chameleons do change colors for is to show their changing moods. For example, a chameleon changes color when it wants to attract a mate, when it wants to be left alone, when it wants to show off, or when it’s excited or afraid. Changes in light and temperature make chameleons change color, too. They can turn lighter to cool off or darker to soak up more sun. You’d hardly notice a chameleon in its natural surroundings. For one thing, chameleons don’t move around much. And when they do, they creep along very slowly. They may even sway a bit to mimic fluttering leaves. All this helps chameleons sneak up on prey. Because their tongues are so long, they can strike from a distance. And because this happens so fast, the prey never knows what hit it. Staying still and blending in also helps chameleons fool hungry birds, snakes, and other predators. And if their camouflage isn’t enough, they can flatten their bodies to become skinny enough to hide behind the branches they’re on. But if that doesn’t work, they can puff themselves up to appear too big and too tough to tackle. Close to half of the world’s chameleons live only on the island nation of Madagascar (see map above). Trouble is, too many are collected for the pet trade. Even worse, too many of their forest homes have been burned or cut down for fuel and logs or to make way for farms and mines. Many chameleons don’t survive the clearing of habitat. And those that do are squeezed into smaller and smaller safe areas. It’s a good thing that some people are working hard to protect Madagascar’s remaining forests. 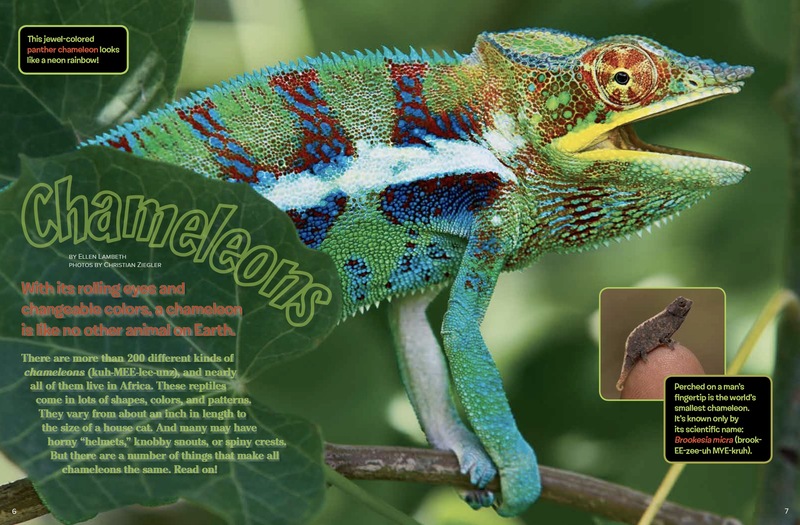 The lives of many chameleons—plus many other animal and plant species—depend on it! 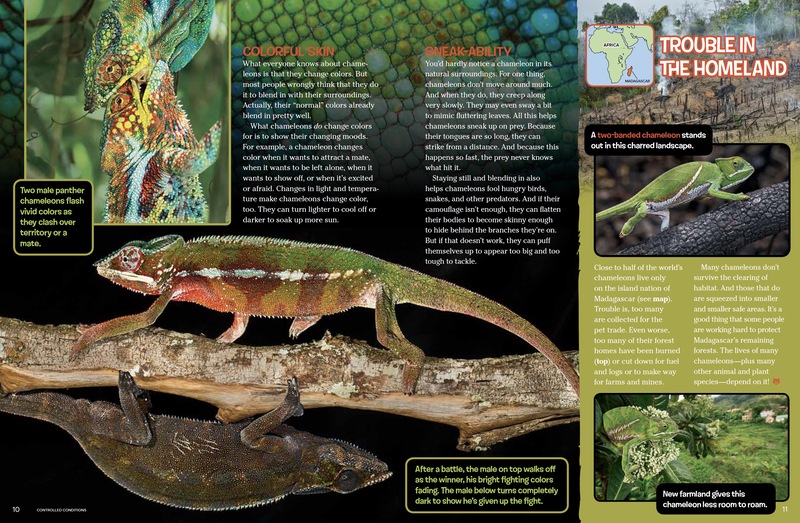 “Chameleons” originally appeared in the December 2016-January 2017 issue of Ranger Rick magazine.